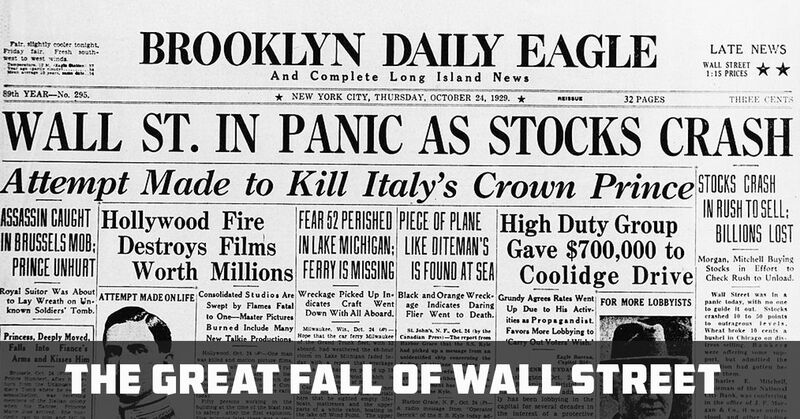 Often hailed as the most devastating stock market crash in the US history, the collapse of 1929 is an event that the world should often turn pages to learn about the market movements and trading. While the stock price collapse lasted only 4 days, there was devastation everywhere which disrupted the economy and gave way to the 12 – year long Great Depression. During the period, the Dow Jones Industrial Average dropped by 25 percent, losing about $30 billion, which in today’s economy would be equivalent to $396 billion. The confidence in Wall Street sank and people were forced to sell their businesses and cash in their savings. The crash marked the end of a trend whereupon, since 1922, the stock market had gone up by nearly 20 percent every year. During the Wall Street Crash of 1929, the leading publications like New York Times and Washington Post played a major role. With sensationalizing headlines like “Huge Selling Wave Creates Near-Panic as Stocks Collapse,” they created hysteria in the market and among investors that triggered the following events. While the crash is long gone, (thankfully) many still remember it vividly. Countless books have been written the following years and decades. It has been a great source of learning. All being said, few could guarantee that such market events may never rise again. In fact, with social media more relevant than ever now and the kind of debt crisis the world is in, the threats like that of stock market crash of 1929 still breathes. Investors must have a thorough investment plan that goes beyond their wishes of making more profits. Investment plan is just as important as any business plan that you make for your company. Identify your take – profit, stop-loss positions, know when you’re going to trade, how much will you trade and what moves would optimize your investment returns. In the stock market, breaking news is a thing of every hour. And most of them aren’t true. So people, for their own benefits, spread fake news to manipulate the market. Sadly, they eventually succeed, given traders – the new ones in particular – heavily consume such news with blindfolds on. Separate news from noise. Select few of reliable stock market news sources and follow only them. These are 3 biggest lessons that we must all take from the great Stock Market crash of 1929. Of course there’s a lot more we can learn. And that these measures do not tamper the possibility of another such crash 100 percent. But from individual stands, as a trader, these small actions can safeguard your wealth by great lengths.